The TB6044 XP gas string trimmer with SpringAssist™ is easy to start and easy to use. This straight shaft 4-cycle trimmer has an over-molded grip and multi-position overmold handle. Designed with the EZ-Link® attachment system to accept all TrimmerPlus® string trimmer attachments, as well as with our optional JumpStart™ electric start adapter. 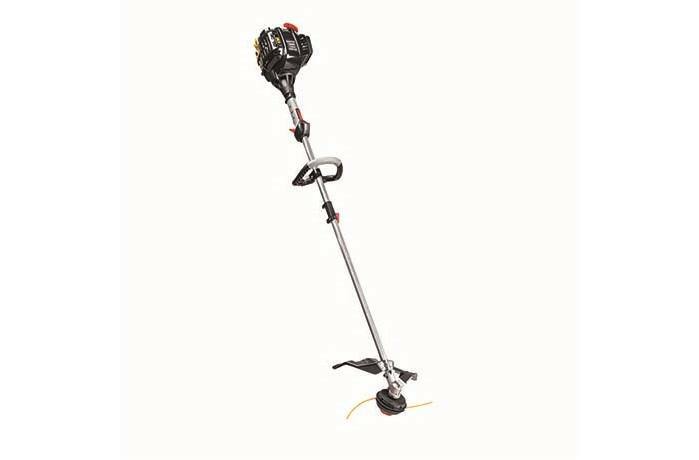 With its ease-of-use, versatility and 3-year limited warranty, this Troy-Bilt 4-cycle gas string trimmer will meet all your trimming needs. No Mixing Oil and Gas: Eliminate the need to mix oil and gas. Troy-Bilt's 4-cycle engines take regular gas. Quick Change™ Bump Head: The Quick Change™ cutting head option makes it easy to refill without disassembling the cutting head. Simply feed the line through the eyelets, and then twist the head to wind the line in seconds.